I wanted to visit an Oberoi residence since a very long time and I had the opportunity to do so during my holidays in Middle-East, before visiting Oman. 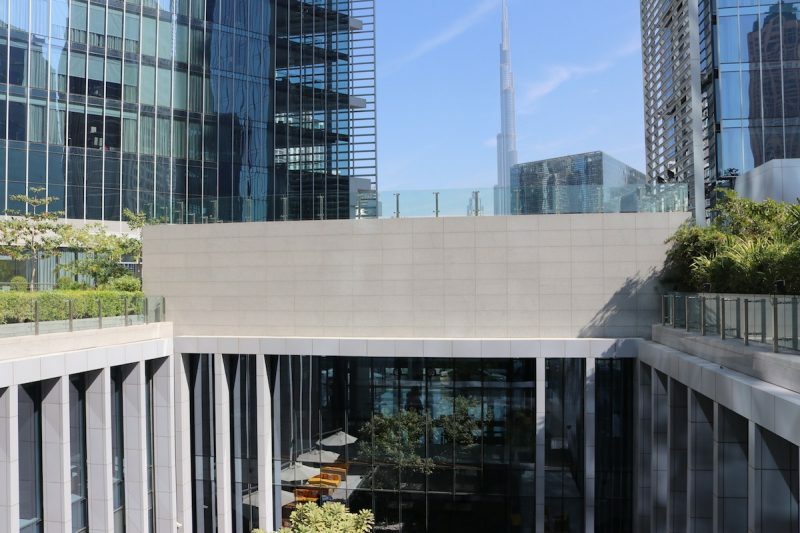 This Indian hotel company is famous for its opulent and ancient palaces, so I was curious about their ability to create such a unique atmosphere in a Dubai’s modern glass building. Do they succeed? Let’s have a look. 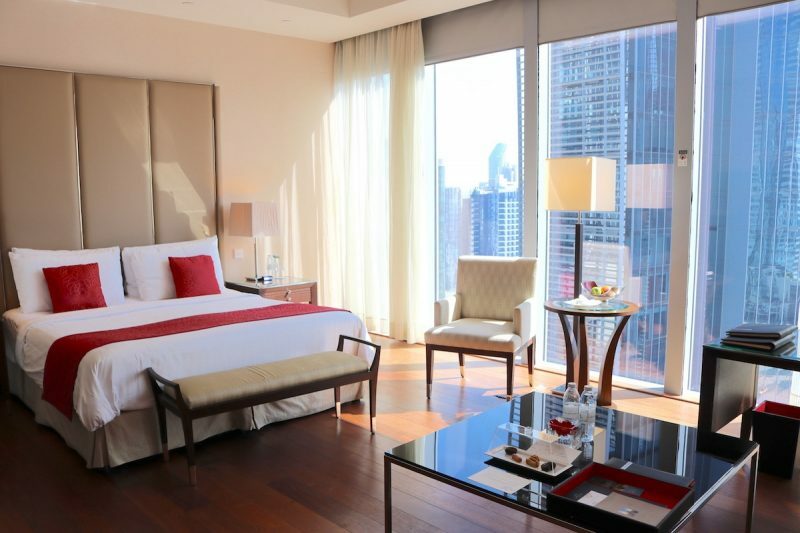 Situated right in the middle of Business Bay, Dubai’s business district, the Oberoi Dubai offers a great location for both leisure and business travelers. A complimentary shuttle service allows to reach Burj Khalifa within 15 minutes and office buildings along Dubai canal are at walking distance. For sure that’s not the best place if you are a beach lover, but this is a great starting point to visit the city. 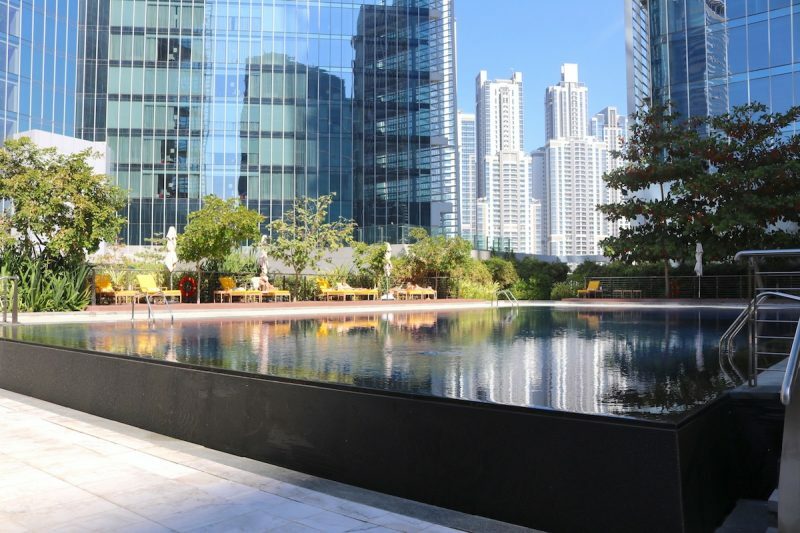 Of course, do not expect to live the Oberoi Rajvilas or the Oberoi Udaivilas experience there, since Oberoi Dubai is a business hotel first and foremost. This being said, that five-star property is still a good choice for luxury addicts and I would like to explain why in the following lines. Arriving by car, the entrance is very private and far away from the bustling city, which is appreciable after a 7-hour flight. We reached the hotel around midnight and were immediately escorted to the reception for a smooth check-in. 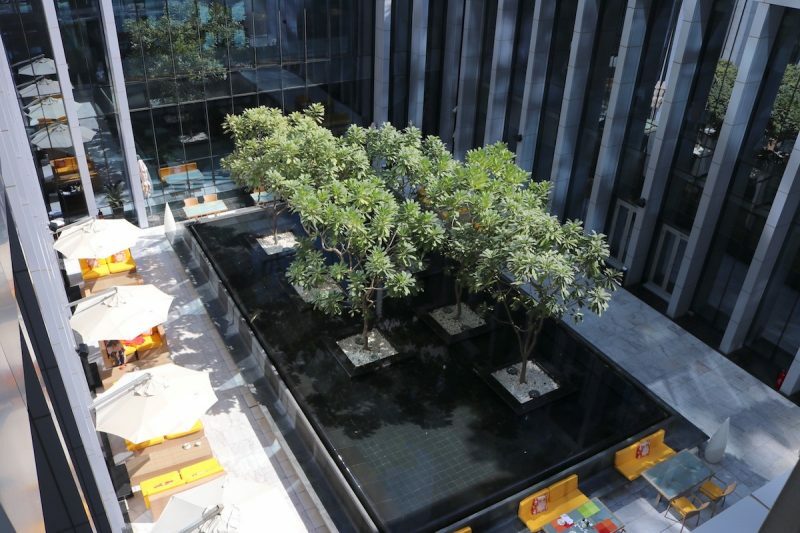 I noticed later, at day time, that the lobby offers a beautiful view over the outdoor’s courtyard and its water decor. Design influences in common areas are pretty international, nothing especially Indian’s or Dubai’s, with amazing space arrangements and orchids touches. That courtyard is really a masterpiece and a fantastic architect idea, it gives lot of charm to the place. We visited the outdoor heated pool on 3rd floor – near fitness center and the Oberoi Spa – and were impressed by its size and the quality of relaxing furnitures. Cherry on the cake, from that floor and above you can enjoy a full view over Burj Khalifa. Stunning! 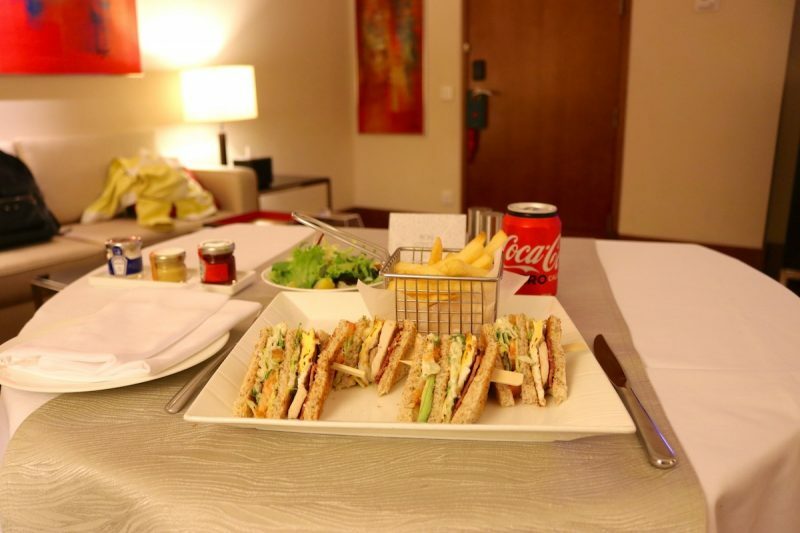 Accommodation was the peak of our stay at Oberoi Dubai. 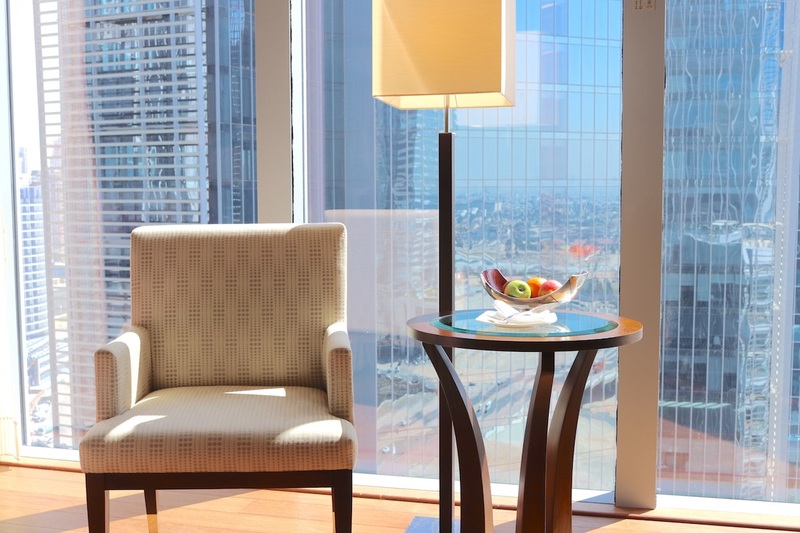 We booked a Luxury Pool View room on 19th floor and have been truly impressed by its quality: large size, floor-to-ceiling windows, wooden floor and high-end furnitures. An epurate design, the luxury business hotel at its best. Just look at this huge bathroom in white marble, with double washbasin and standalone bathtub. One of the most beautiful I ever had in a urban hotel. At that floor, the view was more oriented on the skyline than the pool, though. Not a big deal, even better, I especially loved how bright the room was and how soothing it was. So I really recommend to book a room on high floor and – ideally – with Burj Khalifa view. Buffet breakfast was pretty good, with a large selection of Asian, Indian and Western food. Eggs were cooked a-la-carte and served promptly, I always took scrambled eggs with turkey sausage and mashed potatoes. Delicious! During our stay, service quality was high and faultless. An efficient Front Desk team that did check-in/out super fast without any issue, some friendly doormen who were always helpful for our taxi requests and a perfect Housekeeping that systematically made our room while we were at breakfast. I didn’t expected that much! We are delighted with our stay at Oberoi Dubai. It was our third trip in that extraordinary city so we were fine with its “international standard” design, but maybe first comers – in particular leisure travelers – would prefer a more “exotic” hotel like One&Only Mirage Palace or Palace Downtown. Anyway, no doubt this is a luxury place with a super convenient location and outstanding rooms! Stayed from February 04th to 07th, 2018 – Sponsored media stay, but this article reflects 100% of my opinion and thoughts. The Oberoi Dubai opened in 2013 and is composed of 252 rooms and suites. We stayed in a Luxury Pool View room – around 50sqm – which public rate starts at AED1,050/night.